Get to know the voices from your favorite radio stations, including their go-to workouts and where they find inspiration. The first in her family to graduate from a four-year university, Geena Aguilar, also known as Geena the Latina on Channel 93.3 in San Diego and co-host of the Kramer and Geena morning show, forces herself to eat veggies by drinking green juice, and is passionate about helping teenage girls grow up with confidence. Below, we ask Aguilar for her go-to workout and her favorite regenerative practice. Over the last few weeks, we’ve been introducing you to a few celebrity iHeart Radio DJs—who work out at 24 Hour Fitness—to ask about their relationship with fitness and living a healthy lifestyle. 24Life: What has been your relationship with fitness? Geena Aguilar (GA): All my life, I grew up playing sports. But you know, working out is hard. It’s hard to get yourself motivated. I played college sports, too. But after college, I kind of fell off. That’s why 24 Hour Fitness was so good for me, because my cousin has a membership, and she loves going to the classes, so she totally got me. I’m kind of used to working out in teams. So, it’s good to work out with her. GA: I find that it’s easier to be motivated once you start working out. You have more energy and anyone who has worked out knows that, right? So, it’s only going to help your busy lifestyle by working out. Now the problem is getting to that, right? My advice would be to find something you love, find a class you love. I’m one of those people that will stick to the same yoga class or stick to BODYCOMBAT. Or stick to the same thing because I know I like it. I guess my advice would be to find something you like and do it. And if you need a day off that’s OK, too. Go ahead and take the day off. And once you get in a routine of just doing either the same class or maybe going swimming—I feel like once you find a routine you’ll be more consistent with it. 24Life: What’s your go-to workout or group exercise class? GA: Well, I love BODYCOMBAT because I used to box. And, of course, it’s a great workout. And I like BODYPUMP because, you know, the weights. And I like working out with a group, too, because I don’t think I would be able to do any of that on my own. No, I know I wouldn’t be able to do any of that, on my own! 24Life: What are some regenerative practices you do? GA: I meditate every single day. I’m a big, big fan of meditation, and people say that they don’t know how to do it, but just try to sit. I tried for two years before I finally got it. I like to read; I like to take time to myself. I put myself on timeouts and I think that’s OK because sometimes your mind and body just need to rest. I also take days off from working out when I need to, but sometimes when I’m feeling kind of down I force myself to go to the gym because has anyone gone to the gym and felt worse after? Never. You always feel better. So, I think just taking the time to do things that make you happy and that are going to rejuvenate your soul—I mean that’s the best thing. I always say if you’re not good, you’re not going to be good for others, so you’ve got to make sure that you’re good for yourself first in order to be of service to your family, to your friends, to your spouse, to whomever. So, if that means stopping, taking a break from work and going to yoga class then go to yoga class. If it means going for a walk in the park, go for a walk in the park. Whatever it is to you. So for me specifically I try to do that every single day. 24Life: What stresses you out and how do you de-stress? GA: My number-one stressor is my work. Even though I love my work, it’s very high-intensity—it’s high-adrenaline. There’s just a lot going on. So that’s my number-one stressor. And my number-one stress relief is, honestly, working out. I love yoga. That’s why I love the yoga classes. But I love the BODYCOMBAT classes because you can release your aggression, but then I can be namaste also. I like the balance of that. And I think anyone can agree just running on the treadmill or going swimming, it just releases all the tension from work. 24Life: What’s your power meal or power food? GA: I’m not one of those people that love veggies at all. One time my mom, when I was little, she made me eat green peas and I couldn’t leave the table until I ate them, and guess what? I slept there till the next morning. Yeah, so I don’t like vegetables and I will admit that, but I know how important they are. So, right now I’m on this Suja juice kick. They’re this local company here in San Diego and they put all the veggies in one juice and it’s all organic, no extra sugars. And I literally drink one of those every day just to make sure I get my vegetables in. 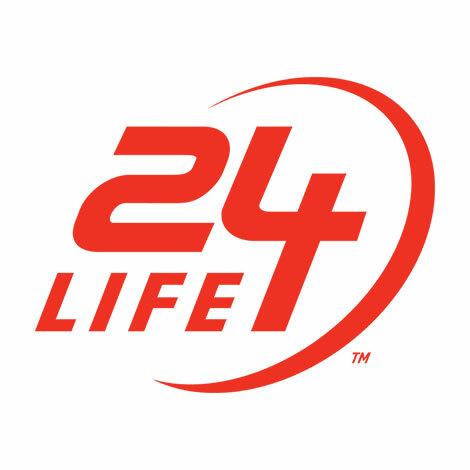 24Life: Any tips for a good night’s sleep? GA: Before bedtime, I try to either read or I meditate. You would think I was Buddha; I’m not Buddha, by the way [laughs]. GA: I am inspired by kids because kids are so honest and they have so much fun and they just love life. And you can put them in the middle of an empty room and they’ll have fun. I think as grown adults we forget to do that, and I think laughter is so important to living a healthy life. So, I’m inspired by kids, because they’re the most honest, real, fun-loving people and human beings on this planet. If we could be more like kids—but responsible kids, maybe—I think we would all have a better life. 24Life: What’s at the top of your workout playlist? GA: It’s funny because I love old ‘90s hip hop and R&B, and I love just like in the gym—I’m trying to be PC right now—that ghetto hip hop, that’s me. I love it; it gets me going. And I can say that because I’m from the ghetto, so it’s OK.
24Life: What would you say to those who aren’t sure where to start in their fitness journey? GA: Don’t be afraid to get healthy and don’t try to do everything at once. I used to be the one that would try to go all day long and lose a certain amount per day or week and blah, blah, and weigh myself. I felt like I’ve gotten the best results when I just enjoyed it for what it is, and I became healthy by doing classes that I enjoy and by doing workouts that I enjoy. Even if you feel like you’re barely starting, and you don’t know where to start, just go. Even if it’s 20 minutes, it’s fine. Even if it’s just on the bike, just go, and you’ll soon start to love it. Make yourself love it. Some people see working out as torture when it’s really not. And that’s why I love 24 Hour Fitness, because there are so many different options to do. I bet you there’s one thing you can find to do and then start there, and then all of a sudden you’ll start finding other things that you like to do, too. 24Life: Besides your job, what are you passionate about? GA: I am most passionate about helping others, and I love my job because—even though we joke about the Kardashians or whatever—when there’s something important to talk about, people listen. When it was International Women’s Day, I was allowed to talk about this huge confidence conference for teens here in San Diego, and I’m allowed to talk about it because my company supports me. It’s a passion of mine, and I love that I’m able to use my platform, because normally we talk about ridiculous stuff on the radio. But when we have something important to talk about, we’re allowed to. I would say I’m passionate about helping the teen girls here in San Diego grow up with confidence because as a woman, it’s hard even as a woman—a grown woman, to be confident and to be OK with body image. I speak in different schools and conferences, and this is the first year we are actually throwing our first huge conference. It’s like 500 teen girls from San Diego. I’m excited for that.